As our VP of Marketing, Caroline Cummings, pointed out in her blog post a few weeks ago, knowing your market is absolutely crucial to being successful in your business. And knowing what your market thinks about you is just as important. Okay, so you know you need to conduct some research… but how? A common–and effective–method for conducting this type of research is through an online survey. There are lots of easy-to-use survey tools, many of them free. Two of the most popular sites of this kind, SurveyMonkey and Zoomerang, merged in December of last year, so now your choice is even easier (if you go to Zoomerang, you will eventually be redirected to SurveyMonkey). The best features of both are now integrated into one tool that’s more powerful than ever. SurveyMonkey is so dominant in its field, in fact, that it claims to serve more than 10 million businesses, including 99% of Fortune 500 companies. It gets results. You can use templates to create the surveys, and even pick questions from a bank of thousands of questions. You’re able to send your surveys out via email, Facebook, web link, or even by embeding directly onto your site. And with strong analytics, you can easily access and filter your results, and create graphs or charts with them (you should then include this data into the marketing section of your LivePlan business plan). If you’re just looking for basic research, you can do it using SurveyMonkey totally for free. If you’re looking for something a little more in-depth, like a longer, more customized survey, you’ll probably want to opt for one of the upgraded, but still very affordable, survey packages. Check out the different packages here to figure out which one is the best fit for your business. 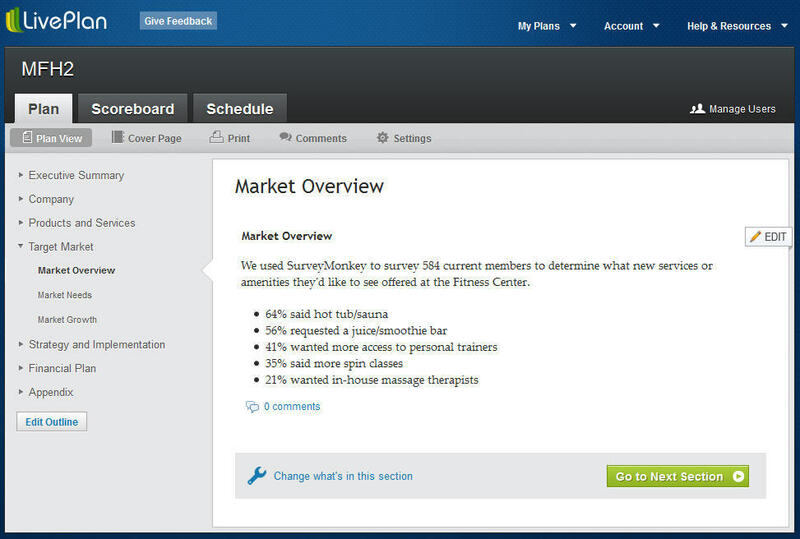 You can also use SurveyMonkey to plan events, gauge customer satisfaction, and get ideas for product planning. There’s a reason why 99% of Fortune 500 companies use SurveyMonkey. It’s an indispensable tool for any business looking to gain insight on its market — which really should be everyone. We use SurveyMonkey here at Palo Alto Software. It helps us better understand your needs so we can build you an even better business planning and tracking tool.